These easy to make tyropitakia (pronounced tea-rho-pea-TAH-khia), are filled with feta and shaped into triangles. They are pan fried and served as finger foods, appetizers, mezedes, side dishes or snacks. Your family or guests will be delighted and they will think that you slaved in the kitchen for hours to make them! The filling is feta but there are many variations on this recipe using different types of cheeses and herbs. If you like can you make a combination of any of these cheeses or you can also substitute with your own favourite cheeses. I like adding some aromatic fresh herbs mixed in the cheese. I’ve tried them with fresh mint or peppermint, oregano, dill, fennel, chervil or Mediterranean hartwort. Each herb has its own unique taste, so use whichever you like best. Mint is one of my favourite herbs, so if I don’t have any fresh herbs, I like adding some dried mint instead. If you don’t want to add the herbs, the “tyropitakia” are equally delicious without them. We always start having in mind how many we want to make. Start with one large egg (60+ grams). Break it a bowl and add some feta. Mash it with a fork. If there is still egg visible in the filling, keep adding feta (or other cheese), until the mixture becomes a thick pasta. Add freshly grated black pepper and your favourite herb. Adding one teaspoon of filling in each “tyropitaki” (singular for tyropitakia) will yield about 24. If, of course, you add more filling you will get less. I cut each phyllo in the middle and then divide each side into three equal stripes, about 6 – 7 cm wide. Start by adding the filling on the top. Fold the phyllo on top of the filling, forming a triangle. Fold it to the left. Fold it to the right. Continue the same procedure. Make sure that the corners are well sealed, in order to prevent the filling to ooze out during frying. Just before you reach the end, brush the phyllo with olive oil and fold again to form the triangle. We brush it with olive oil so that it sticks together and will not open during frying. This is the most “difficult” and tricky part of the whole procedure. The first batch will fry well because the oil is not very hot. After adding the second batch, the temperature will be much higher and the phyllo will burn much quicker. You will see that as soon as you put them in the frying pan, they will immediately start browning and by the time you turn them all over, the first ones might burn. I use two forks to grab them and turn them over. I turn them, one of the corners facing down, above the frying pan, just for a few seconds, for some of the oil to drip in the pan. It is advisable that there is someone there to help you while doing this. While you are taking some out of the pan, the other person adds more, in order to prevent the oil temperature from rising. Remove them on kitchen paper, so that more oil is absorbed before serving them. Once you get more experience doing this procedure, you can then do it alone, as I do. If you want to bake them, then you have to brush the whole phyllo with olive oil or clarified butter and after folding them, brush them again on top. Bake in a preheated oven to 180o C /350o F, for about 20 minutes or until golden on top. If phyllo is frozen, defrost it. Keep the phyllo covered with a towel so that it does not dry. Beat the eggs with a fork and add feta and anthortyro and press with fork. Add halloumi or graviera gradually until all the egg is absorbed. Add pepper and fresh mint and mix them well. Using a sharp knife or kitchen scissors, cut each phyllo into equal sized stripes about 6 – 7 cm (2 – 2 ½ inches) wide. Place a teaspoonful of cheese filling on the top edge and fold into a triangle. Continue folding the triangle first in front, then to the left, then infront, then to the right until the end of the phyllo stripe. Brush the last part with olive oil and fold. Keep them covered until the time of frying. Fry them in hot olive oil until golden and crispy turning them once. Remove on kitchen paper to absorb excess oil. You can find a similar recipe in my cookbook Mint, Cinnamon & Blossom Water, Flavours of Cyprus, Kopiaste! Find more about my Cookbooks here. 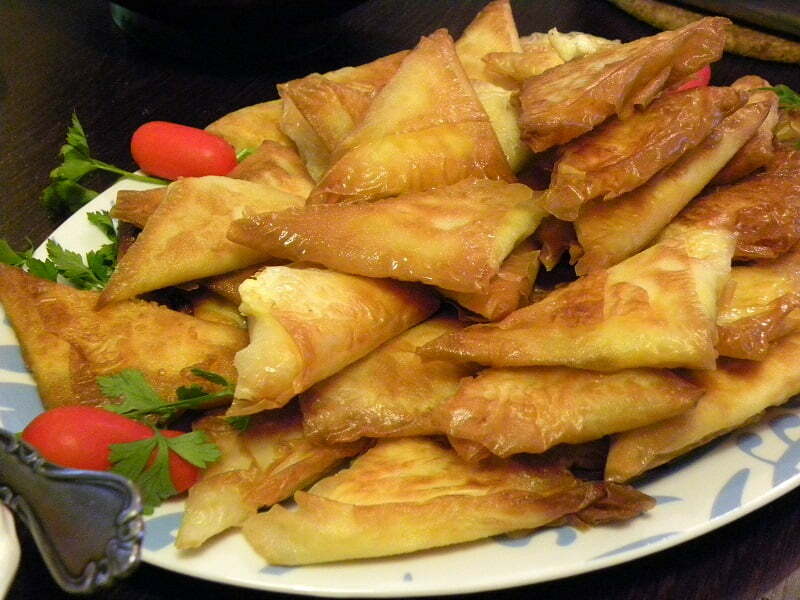 These tasty cheese-filled triangles are finger foods which can be served as appetizers, mezedes, side dishes, and snacks. Put the egg in a bowl, add feta and mash it with a fork. Add freshly grated black pepper and crumbled dried mint. Mix until all the egg is absorbed and resembles a thick paste. Using a sharp knife cut the phyllo sheets in the middle and then into equal sized stripes, about 6 – 7 cm (2 - 2 ½ inches) wide. Place a teaspoonful of cheese filling on the top edge and fold into a triangle. Bring forward and fold to the left. Bring forward again and then fold to the right (as if folding a flag). Continue the same procedure, to the end of the phyllo stripe. Just before the end brush with some olive oil and fold. Fry them in hot olive oil until golden and crispy turning them once or twice until golden. If phyllo is frozen, defrost it. Leftover phyllo must be wrapped and stored in the refrigerator. During hot weather, keep the phyllo sheets covered with a tea towel. I think I will make with puff pastry as i am not that good in handling phyllo, last time i tried, some of them opened up. I will try with feta and with goat cheese. Good luck! I hope you will like them.